It is time again for the WWF’s Thanksgiving tradition, but this year, they moved the event to Thanksgiving Eve. It would stay in that position for the next few years. You would think that this would give the superstars Thanksgiving off, but they still had to work a house show the following day. Also, the WWF made another change to the event. This year, they broke from tradition to present a one-on-one match for the WWF Title. Hulk Hogan will defend his WWF Title against the Undertaker. However, things are not going so well for Mr. Hogan or the WWF. In 1990, a doctor by the name of George Zahorian was arrested for the illegal distribution of steroids. He was the doctor who supplied many of the WWF stars with their drugs and this information was revealed to the public. They held his trial in 1991 and he was convicted, which brought the eye of scrutiny upon the WWF and its stars, including Hulk Hogan. In an attempt to clear his name, Hogan appeared on The Arsenio Hall Show and denied using steroids. The problem is, Randy Savage had previously appeared and admitted to using them. No one believed Hogan’s story and damage was done to both his and the WWF’s image. Crowds began to turn on Hogan. There were more and more boos from the adults, who were becoming fed up with Hulk. Meanwhile, Ric Flair arrived in the WWF. He debuted on an episode of Prime Time Wrestling, with the Big Gold Belt in hand. WCW quickly threatened a lawsuit, so the belt was eventually returned. The WWF attempted to use a replica, but WCW also squashed that. They finally decided to have Flair carry around a tag title belt and they blurred or pixelated the image on TV. It was still obvious what he was holding. Flair immediately began challenging Hogan to a match, which led to a string of house show matches between the two men, but they were holding off on a televised encounter. However, don’t hold your breath on that happening. We will discuss why soon enough. In other news, the WWF decided to answer WCW’s growing list of PPVs by toying with the idea of adding shorter and cheaper events to the schedule. On this show, they frequently plug another PPV that will air the following Tuesday. It’s aptly named This Tuesday in Texas and they will run it into the ground throughout this show. This idea would eventually lead to the In Your House series of PPVs, but that won’t happen for another few years. The PPV opens with the Survivor Series logo and a shot of the crowd while Gorilla Monsoon welcomes everyone. He says the crowd is roaring in anticipation and they’re also roaring about the events of the past weekend. They show a clip from Superstars, where Jake Roberts tied Randy Savage in the ropes and attacked him. Jake then retrieved his pet cobra and unleashed him upon the prone Savage. The snake bit Randy on the arm and wouldn’t let go, so Piper left the commentary booth to help. Fans screamed while Jake shook the snake. It looked like he was trying to provoke it, but he was trying to get the snake to release its bite. According to Jake, it took quite a while, so the footage was edited to make it seem shorter. On commentary, Vince McMahon speculates as to whether or not the snake was devenomized, while doctors arrive to help Savage. Elizabeth also arrives and screams, as Jake keeps everyone at bay with the snake. Savage frees himself from the ropes and tries to attack Jake, but he’s too dazed. The officials are finally able to place Savage on a gurney, but he falls off and tries to fight his way back to the ring. However, they eventually get him to the backstage area. This was a great and memorable angle and an amazing visual. Next, they cut to Jack Tunney in his office. He says that he cannot in good conscience allow Savage to wrestle at Survivor Series. He also says that he accepts Jake Robert’s explanation that it was an accident and that he believed the snake was devenomized. However, he is granting Savage’s request for reinstatement and booking a match between Savage and Roberts at the earliest possible date. That date is This Tuesday in Texas. Tunney then states that he is barring any reptiles from ringside. He also says that Jake Roberts will not be participating in Survivor Series, so the match he was involved in will now be 3-on-3. I will discuss the changes to that match when I cover it later. Gorilla and Bobby Heenan then welcome everyone to the show and discuss Savage’s reinstatement. Heenan says that Savage might be reinstated, but this Tuesday in Texas, he could be terminated. Gorilla then talks about the rest of the card and the WWF Title Match. He claims that the Undertaker is Hogan’s greatest nemesis, but Heenan corrects him. He says it’s the gravest challenge. Then, Gorilla jokes that Undertaker might have a weasel-size casket at ringside, which annoys Heenan. When Ric Flair entered the WWF, he immediately started angering multiple people. 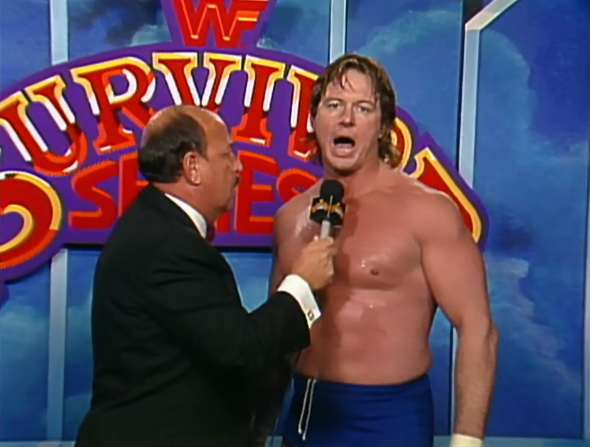 He went after Hogan, but he also went after his old NWA friend, Roddy Piper. At one point, he taunted Piper, who was on commentary and ended up hitting him with a chair. Piper would then make it a point to interfere whenever Flair stuck his nose in Hogan’s business. Also, there is another bit of news before I start this match. Slick has retired as a manager, so the Warlord hired a newcomer in Harvey Wippleman. He is a friend of Sid, whom Sid convinced the WWF to hire. He was known as Downtown Bruno in other companies, but now he is Harvey Wippleman. He’s known for being a scrawny, sniveling little annoyance that thinks he’s way tougher than he is. He will be a mainstay in the company for years to come, so get used to him. Ted DiBiase leads most of the team to the ring, while his music plays. The camera gets a shot of Sherri, who is dressed like a 20s flapper. Heenan says, “Is she beautiful, Monsoon? Is she a looker?” The camera switched to another shot, so Gorilla replies, “Who? The Mountie?” I have to admit, that got a chuckle out of me. Flair enters next to his own theme. I know I’m in the minority, but I prefer this version. The 2001 a Space Odyssey music is a bit overplayed. Ric is accompanied by Mr. Perfect, who is working as his executive consultant while Perfect’s back heals. Flair opens his robe and lifts the distorted belt, but it’s obvious that he’s using a tag title. I wonder what the crowd thought of that. Then, the face team enters individually. Bret and Virgil enter and we are informed that Virgil already lost the Million Dollar Belt back to DiBiase. Bulldog enters next and Heenan thinks that Gorilla called him the bullfrog. Then, Piper enters to a great reaction. He has finally recovered from injury, so we don’t have to put up with him on commentary anymore. This was a pretty good opener. There match had good crowd heat and there was some fun storytelling. However, the finish was a bit lame. It felt like they were going a bit long and decided to end it abruptly. I get that they were trying to make Flair look strong, but I’m not sure they accomplished that feat. Heenan is delighted that Flair was the sole survivor, which annoys Gorilla. He threatens to have Heenan removed, but Bobby ignores him and grabs a phone to call Mr. Perfect. No, you aren’t seeing things. I did put Sgt. Slaughter on the correct team. He has turned babyface again. Slaughter appeared on TV and begged for forgiveness. He then made a tour around the country and visited schools to show that he was a good American again. His rallying cry was, “I want my country back!” To me, that sounds more accusatory than apologetic, but at least it ended that awful storyline. Also, this match sees a few new faces and one new gimmick. First, Tito Santana went to Mexico to return to his roots. He underwent bullfighter training and became, El Matador! Next, we have the debut of the Berzerker. He’s a Viking-like character that carries a sword and shield and chants the word, “Huss!” I have no idea what that means. He’s basically a knock-off of the wrestler, Bruiser Brody. Then, we also have the debut of Skinner. No, he’s not a school principal and he didn’t bring any steamed hams. He’s an alligator hunter from the Everglades and he stole Stan Hansen’s chewing tobacco gimmick. He’s played by journeyman wrestler, Steve Keirn. They show a graphic of this match and Gorilla jokes that there are some beautiful kissers in that photo. I don’t think that came off the way he intended, but it made me laugh. The heel team enters to Mustafa’s theme and Skinner already has tobacco spit running down his chin. Then, Tornado enters and kisses a young fan on the cheek. She looks like she’s about to faint. El Matador follows him and Heenan jokes that he will be a human piñata. Then, Duggan & Slaughter join them. 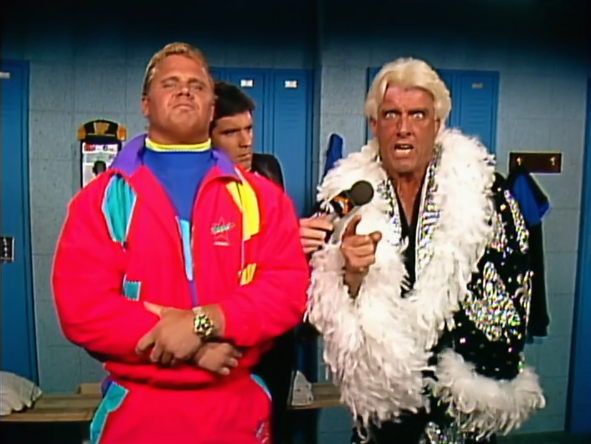 Heenan says that Jim Neidhart was supposed to be on this team until Flair injured him with the Figure Four. Gorilla talks about how Duggan and Slaughter are proud to support Old Glory, so Heenan replies, “Old Glory? Did she used to dance?” Gorilla tells him to be serious. The crowd reacted well to this match, so I guess it did its job, but it wasn’t very good. I’m not sure why the faces got a clean sweep. It’s not like anyone on their team is heading for a big push. In fact, only one person in this match gets anything of note after this and he’s on the heel team. I guess they did this for a feel-good moment and to try and convince people to cheer Slaughter. That is one hard sell and it never fully works. Slaughter would remain a bit-player for the rest of his run. 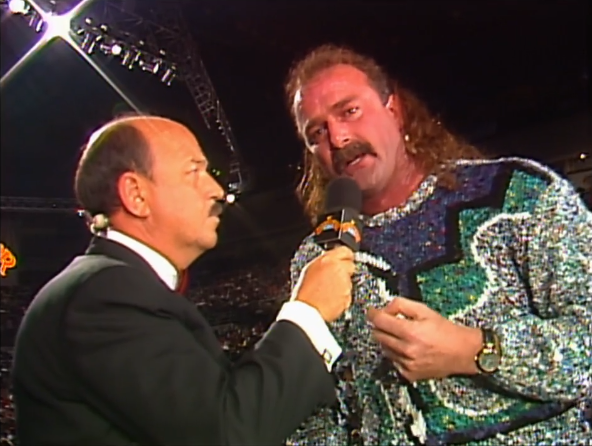 Gene is at the interview podium again and he welcomes Jake the Snake Roberts, who enters to his awesome new heel theme music. Gene brings up the events of the past weekend and says that Jake claims it was an accident. He also says that Jake claims the snake was devenomized. Jake replies, “Cross my heart and hope to die. That’s what I was told,” but he says it with a grin. Then, Gene brings up the anguish and torture that Jake put Randy and Liz through and Jake says it excited him. Gene calls him a sick man, so Jake thanks him. Gene also says that people thought Jake should be fired, so he’s fortunate to get a match with Savage. Jake accuses Gene of trying to cast him as the original sinner, but Roberts says he spoke to god this morning and god doesn’t like Gene. Jake then says they need to point the finger of blame at someone else, like those who voted for Randy’s reinstatement and Jack Tunney. Then, Jake laughs and says that Elizabeth has a one-way ticket to the other side at This Tuesday in Texas. He says it’s not the end, or the beginning, or even the beginning of the end. It’s the end of the beginning. This was an awesome promo by Jake. He is well suited to being a heel and you can tell he’s enjoying every second of playing one. Next, they show a recap of the Hogan/Undertaker feud. 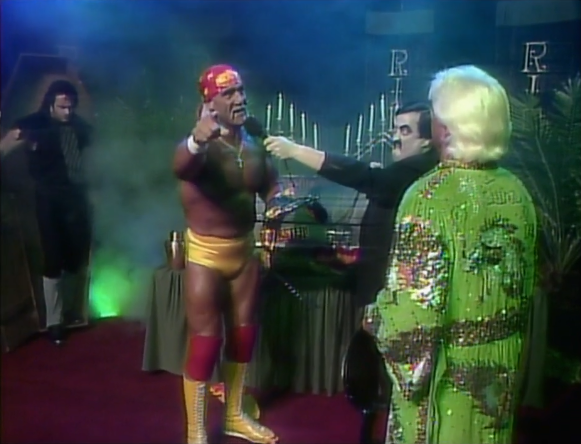 Hogan made an appearance on The Funeral Parlor with Paul Bearer. Ric Flair arrived to confront him and said that he had been waiting a long time for this. He said he had to listen to Hogan talk for too long and then tells Hogan not to be ashamed of the butterflies in his stomach. He says he just burst the bubble that Hogan was living in and asks Hogan what he’s going to do when Ric Flair runs wild on him. Hogan tears his t-shirt and challenges Flair to put his title on the line. However, while he’s talking, the coffin opens and the Undertaker emerges. He grabs the urn and whacks Hogan in the back of the head before Flair begins stomping Hulk. Piper and Savage leave the announce table with chairs and try to stop the attack, but Undertaker isn’t fazed. He reaches down and breaks the crucifix necklace around Hogan’s neck before dropping it on his chest. The Undertaker enters first and they show scared children in the crowd. One kid looks worried until he sees that the camera is focused on him. Then, he becomes excited and waves. Hogan enters next and the children cheer, but you can see some adults booing and giving him the thumbs-down gesture. The camera makes sure to show that Hogan fan who always dresses like Hulk. When Hogan arrives at ringside, he finds a casket with, “Hulkamania,” written on it and he shoves it to the floor before entering the ring. He then tears his t-shirt and poses. He also throws his bandanna at Undertaker, who doesn’t flinch, but Hogan recoils slightly when it misses him. Hogan can’t faze the Undertaker early and Taker hits a shoulder block, so Hulk surprisingly takes a breather on the outside. Heenan calls him out for it, but Gorilla says it’s smart. Hogan returns, but Taker hits throat chops and chokes him. He even rips at Hogan’s face, so Heenan jokes about a face-off. Then, Taker distracts the ref and Paul Bearer chokes Hogan before telling him to rest in peace. Undertaker then hits a slam, but he misses an elbow drop, so Hogan responds with a running clothesline. It doesn’t work, so he tries a slam, but he can’t lift him. Finally, Hogan manages to clothesline Taker out of the ring, but he lands on his feet and pulls Hogan to the floor. He then rams Hulk into the steps and chokes him with cable while Bearer distracts the ref. Heenan claims his monitor stopped working, so he didn’t see it. He then takes Hogan back inside and grabs a claw hold on Hulk’s face for a while. Hogan eventually fights back and hits a couple of shoulder blocks, but Taker answers with a jumping clothesline. He then hits the Tombstone—but Hogan pops up to his feet. Hulk staggers Undertaker with punches and signals for a slam, but Ric Flair arrives at ringside. Hogan does hit the slam, but both Bearer and Flair distract him. Hogan goes after Flair and knocks him down before returning to the ring and hitting a big boot. However, Paul Bearer trips Hogan and Undertaker hits a throat chop. The ref is distracted by Paul Bearer, so Taker lifts Hogan for the Tombstone and Flair slides a chair into the ring. Undertaker Tombstones Hogan onto it and then covers him for the win. This was a slow match and it wasn’t great, but they never lost the crowd. At this point, the Undertaker was more about his character presentation than his in-ring work and the character was good. It was nice to see Taker win his first title and he was definitely over enough to warrant it. Plus, the storyline work was done well in this match. It accomplished what it needed to do, despite not being a good match. After the match, Bobby Heenan gleefully declares Hulkamania dead, as Taker collects his belt and slowly walks to the back. WWF officials check on Hogan, who is still laying on the mat. Gorilla and Bobby compare the situation to an NFL player who recently broke his neck. That is kind of questionable to compare a storyline to a real-life injury. Hogan eventually sits up, which gets some boos from the crowd. For years, Hogan claimed that Undertaker legitimately injured Hulk’s neck in this match. The Tombstone looked as safe as possible. Hogan’s head was way above the mat, but Hulk claims his head hit Taker’s inner thigh and jammed his neck. It didn’t look that way to me, so this could be another Hulk Hogan tall tale. Then, Sean Mooney is with Ric Flair and Mr. Perfect. Mooney asks what business Flair had at ringside, but Perfect interrupts him. Perfect says, “Ashes to ashes and dust to dust. Hulkamania had to bust!” He also says that no amount of tears will bring it back. Ric Flair then asks what people thought was going to happen. He says he told Hogan that he would be short-lived and he talks about how children were crying. He says their parents are wondering what will happen next. Then, he says that the kids may have said their prayers, taken their vitamins and gone to the ends of the Earth with Hogan, but now it’s over and there’s only one World’s Heavyweight Champion. Flair says you know it’s him and Hogan is on the way to the hospital because of the Undertaker. Um, I think he means a medical facility. I’m sure Vince corrected him later. He also says that there will be no more Hollywood, no more limousines, and no more kids running wild. Then, Flair warns Jack Tunney that if he keeps distorting the belt, everyone will pay the price. Finally, he says that the WWF Title is in the coffin of Hulkamania. This was a great promo that made Flair seem like an absolute madman. The show then goes to intermission and returns to Gene, who recaps the night. He says that Jack Tunney is caucusing with Hulk Hogan about the results of the match. 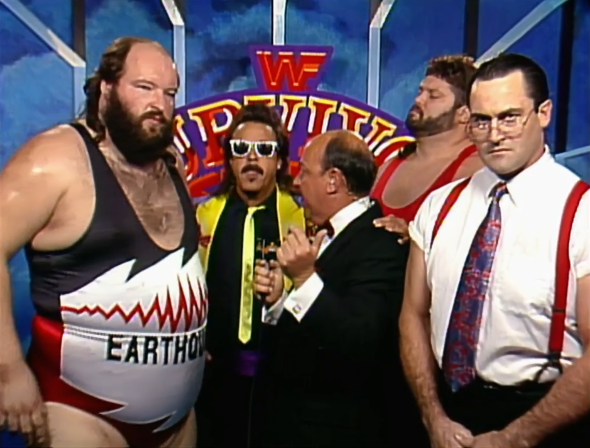 Then, Gene welcomes the Natural Disasters, Jimmy Hart, and IRS. Gene says he is shocked, but Quake interrupts him and says he wants to talk about aftershocks. He says that after IRS eliminates Boss Man, Typhoon will splash the LOD. He also says that people will be shocked when the LOD are eliminated from the Survivor Series. Quake tells them they are doomed for disaster, which is a great line. Jimmy Hart then claims this match should have been 4-on-3 because it’s not Jake’s fault that he couldn’t be in this match. 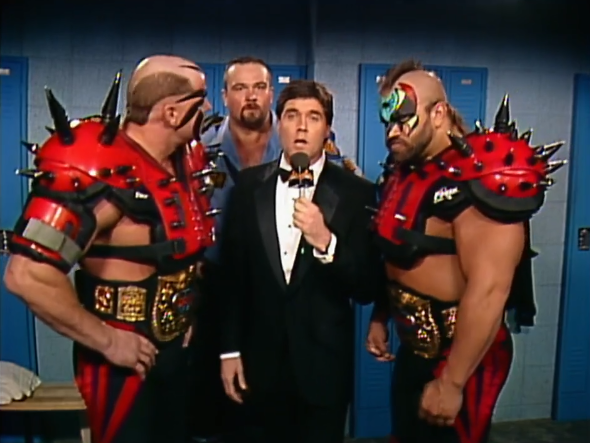 He also says that Savage was bit by a little snake and didn’t have the guts to crawl into the ring with these guys. I’m not sure what Jimmy is rambling about. Sid was supposed to be in this match, not Savage. They only removed Sid because Jake was removed from the match and they wanted it to be 3-on-3, so nothing that Jimmy is saying makes sense. Did he forget the booking? Next, IRS says he’s there to make sure the Boss Man pays and then warns Tunney that he will be audited because of his decisions. Finally, Typhoon says that Tunney’s decision won’t affect the match because they will still come out on top. Next, Sean Mooney is with the Legion of Doom and Big Boss Man. Sean says it will be 3-on-2 tonight. It seems everyone is having trouble figuring out what is happening with this match. Animal doesn’t correct him immediately. Instead, he says that Tunney made his decision and they will abide by it. He also says it will have no bearing on the match because it’s 3-on-3 and they didn’t get their belts by beating nobodies. That was nice of him to put over the Nasty Boys like that. Then, Boss Man calls the other team trash and says their comments only made them mad. He singles out IRS and says the thing between them is personal because he’s no tax cheat and he doesn’t take payoffs. He then says they will serve hard time before asking Hawk for his thoughts. Hawk says Jake Roberts can consider himself the luckiest man on the planet because they are going to reduce the other team to the equivalent of soggy, soiled, fly-covered sweat socks. He then attempts to say his signature line, but Mooney interrupts. Hawk threatens him before completing his sentence and then Sean says that Gene is with Jack Tunney. Gene says that he’s never seen something so despicable. That’s mean. I thought the LOD’s promo was good. Oh, that’s not what he meant. Tunney says that the referee’s decision is final, but it is within his authority to order a rematch at the earliest date. Take a wild guess when that is. If you guessed This Tuesday in Texas, you win! Tunney also says he will be at ringside for the rematch to ensure a fair outcome. We shall see how well that works out for them. Heenan says that it’s not fair and asks whether they consulted with the Undertaker. Gorilla replies that Tunney doesn’t have to, so Bobby says they’re stacking the deck against Taker. This match gives us the PPV debut of the Beverly Brothers (Blake & Beau). They are a team of kayfabe brothers with the gimmick of prim and proper rich snobs. It’s not a great gimmick and the only good thing about them is their music, which they don’t have yet, and the return of the Genius as their manager. This match was slow at times, but it was decent. Plus, the storyline work between the Rockers was good. They had shown signs of dissent in the past weeks and this miscommunication was the tipping point. I think we all know where this leads and it’s awesome, but I will discuss that soon enough. Gorilla and Bobby talk about the dissension between the Rockers and Heenan brings up an article in WWF Magazine about the issues between them. Gorilla doesn’t seem to realize that Bobby is being serious, which shows how little Monsoon pays attention to the magazine. Heenan then becomes distracted by some unruly kid and yells, “Same to you, kid!” When Bobby turns back around, he realizes the segment is over and accuses Gorilla of hogging all the camera time. I get that they wanted to sell the storyline with Jake Roberts by pulling him from this match, but without him, this doesn’t feel like it belongs in the main event slot. I think they should have put Savage in Sid’s spot and kept Jake in the match. They still could hold off on the one-on-one match until This Tuesday in Texas and then this match would have felt bigger. However, that’s not what we got. Poor Sid didn’t even make it onto the show because of the changes. The match was decent enough, but it sorely needed the inclusion of Savage and Roberts to feel important. There was some good storytelling in this, but it felt kind of flat for the main event slot. After the match, the LOD and Boss Man pose, while Heenan and Monsoon talk about how This Tuesday in Texas will be even better than this. Way to make this show feel like an afterthought! Meanwhile, Sean Mooney is backstage and says he talked to Hulk Hogan. He says that Hogan has the eye of the Hulkster and this Tuesday in Texas, Hogan has vowed to become champion again. He then says that he tried to get Hogan on camera, but Hulk said he would do his talking—this Tuesday in Texas. Gorilla and Heenan then plug—you know what. Monsoon says Hogan could become an unprecedented four-time champion. He also talks about Savage vs. Roberts before hearing that Gene has found the Undertaker. Gene is in a smoky room in what he calls the bowels of the building. He finds Undertaker and Paul Bearer there and says they can’t be happy about Tunney’s decision. Paul Bearer claims that Hulkamania died tonight and usually you would hold services immediately. However, Paul claims they will hold him over in the embalming room until Tuesday and then eviscerate him. Next, the Undertaker says he warned everyone what was in store for Hogan. He then invites Gene to look inside a coffin, which has a point-of-view camera inside. Gene nervously looks down into the camera, while Undertaker says Hulkamania died at Survivor Series and this Tuesday will be its burial. – The opening match was fun. – There was some great storyline work on this show. – Both Savage and Roberts’ promos were great. – It was nice to see Undertaker win his first title. – Most of the Survivor Series matches weren’t great. – The title match wasn’t very good. – They ran This Tuesday in Texas into the ground. I’m going to give it to Ric Flair. He was good in the first match and his promo was great. His involvement in the title match was good too. Plus, it’s nice to see him in the WWF. I wanted to like this show. It even has some nostalgia for me because it was the first old-school tape that I rented after I started watching wrestling. However, this isn’t a great show. The constant plugging of This Tuesday in Texas made it feel like an afterthought. I would have hated to buy this show back in the day only to be told I needed to buy a second PPV to see the important stuff. It felt like a three hour commercial for another PPV. This was a bit of a stumble on the WWF’s part. Thank you for reading. You can follow the Facebook page for this blog here and the Twitter page here. I post goodies and updates on the Facebook page, so be sure to give it a look and send me your feedback on the review. My next review will be—This Tuesday in Texas. However, don’t be confused. The review will still be posted on a Saturday.